Have you been terminated by your agency (or are you facing the threat of termination) because of your medical inability to perform the functions of your federal or postal job? If so, you may be entitled to severance pay. This article reviews OPM’s position on severance pay for federal employees who have been medically terminated. It also discusses the pros and cons of severance pay for FERS Disability Retirement (FDR) applicants. But first, let’s review the definition and eligibility requirements for severance pay. Generally speaking, if you are a federal or postal worker who has been removed from federal service by involuntary separation (i.e., separation for reasons other than unacceptable performance, attendance, or conduct), you are entitled to the following: one week of severance pay for each of your first 10 years of creditable service, and two weeks of severance pay for each additional year of creditable service. For example, if you have 16 years of creditable service at the time of your removal, you are entitled to (1 × 10) + (2 × 6) = 10 + 12 = 22 weeks of severance pay. Note: There is an additional “adjustment” to this computation for individuals over the age of 40 (to account for the difficulties and obstacles that “older” job seekers are likely to encounter). 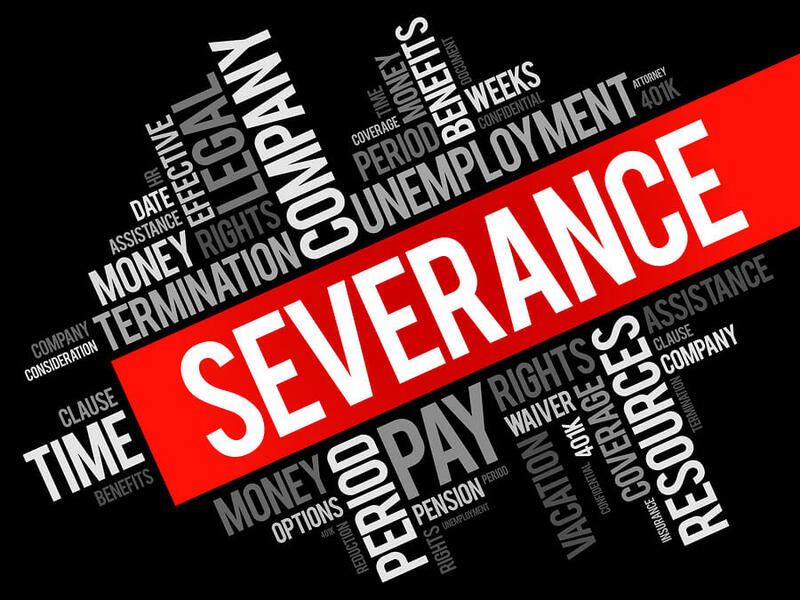 The Office of Personnel Management (OPM) has posted a fact sheet on their website entitled “Severance Pay,” which includes a detailed description of the eligibility requirements. Also included is a link to a worksheet, which can help you estimate how many weeks of severance pay to which you are entitled. As of the date of this blog, this fact sheet can be found here. Does an employee who has been removed for medical inability to perform his or her duties have an entitlement to severance pay? The applicable statute authorizes severance pay for employees who are “involuntarily separated from the service, not by removal for cause on charges of misconduct, delinquency, or inefficiency.” (See 5 U.S.S. 5595(b).) A medical inability to perform one’s duties is neither “misconduct” nor “delinquency;” therefore, the precise question is whether removal for such inability constitutes “inefficiency” for severance pay purposes. The legislative history of the severance pay statute suggests at least two guidelines for interpreting its provisions. First, severance pay is intended to help individuals who lose their Federal jobs through no fault of their own. Second, severance pay benefits should be construed liberally in favor of the employee. Accordingly, an employee who is removed for inability to perform his or her duties may receive severance pay if the inability is caused by a medical condition that is beyond the employee’s control [emphasis added]. This determination should be made by the employing agency based on acceptable medical documentation provided by the employee. Although it is clear from the above statement that OPM supports the issuance of severance pay to individuals who have been separated for medical inability to perform, it is important to note that the ultimate decision is made at the agency level. If you are currently in the process of applying for FDR, then you are probably aware of the time frames involved. Not only can it take several weeks (or months) to complete the paperwork, but once your claim has been submitted to OPM, it can take an additional 6 – 14 months to receive a decision. To be clear, your disability benefits are retroactive to your last day of pay (LDOP). However, if you’re like most applicants, you don’t have the financial resources to go several months without a paycheck. Thus, severance pay may be a viable solution to your short-term, cash-flow dilemma. It should be noted, however, that according to the OPM fact sheet, an individual is NOT entitled to severance pay if he/she is “…eligible upon separation for an immediate annuity from a Federal civilian retirement system…” This means that if you are ultimately approved for FDR, you will be required to reimburse your agency for any severance pay that you have received (unless your agency agrees to waive the repayment). Thus, I always tell my clients to think of severance pay as an interest-free loan. In other words, severance pay provides you an income during those months you’re waiting for OPM to process your FDR application, and in most cases, the recipient is allowed to pay back severance via small monthly deductions from his/her FDR annuity (interest-free).